February 28, 2011  A longtime Bahraini exile has returned home to join the protesters in the capital. The protesters seem to be hardening their position on a proposed dialogue with representatives of the monarchy, saying there can be no talks until the regime steps down. February 24, 2011  Saudi Arabia's King Abduallah has put money on the table to try to head off the popular youth-led protests that are sweeping the rest of the region. The king, 87, granted citizens a Saudi-sized gift of $35 billion. The money goes to address the lack of affordable housing and youth unemployment. February 23, 2011  More than ever before, Saudis are demanding political reform. They are unlikely to march in the streets, but a political scientist says the king's announcement of new unemployment and housing benefits probably won't be enough. February 21, 2011  There are jitters in Saudi Arabia as the protests across the Arab world get close to home. The Saudis are nervous now that there are revolutions on their borders with both Bahrain and Yemen. February 21, 2011  From Libya to Bahrain, Arab leaders are challenged by a new kind of movement: Leaderless, mostly young people, who share many of the same demands. Arab leaders have responded with familiar tactics — from offering concessions to sending in the military. 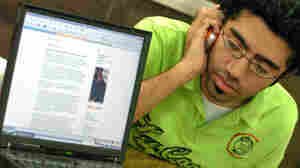 February 18, 2011  The Arab region has the highest number of unemployed young people in the world. At the same time, there are more educated young Arabs than ever before. It's created a revolution of rising expectations in Saudi Arabia, among other countries. 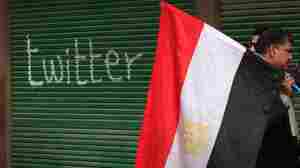 February 17, 2011  During the social-media-driven revolutions in Tunisia and Egypt, many Americans discovered Twitter for the first time. Meanwhile, Sultan Al Qassimi tweeted minute-by-minute updates of the events. February 9, 2011  U.S. allies in the Middle East are watching the Obama administration's pronouncements on Egypt with anxiety. Mubarak was Washington's man for 30 years. Now, Obama wants him to go. What does that mean for other American friends? Can Arab Leaders Spend Their Way Out Of Discontent? February 7, 2011  In response to Tunisia and Egypt, many Arab governments have rolled back subsidies to keep food prices low. Economics as well as freedom play a role in the Arab world's turmoil. However, buying their way out is a short-term solution that will be costly. Algeria, Syria, Morocco and Jordan will have budget shortfalls, and the World Bank will not look kindly. Kuwait gave every citizen $3,000 and still, protests are called for this week. Unemployment among the young is one of the fundamental problems fueling unrest. In Saudi Arabia, a new study shows that 70 percent of crimes are committed by unemployed college graduates. February 6, 2011  The street protests in Egypt demanding political change haven't reached Saudi Arabia — and most analysts don't think they will. 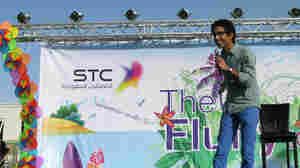 But deep in the desert, some young Saudi comedians are taking on the demonstrations as a source of material — and even joking about their own nation. February 3, 2011  In a country where most people don't watch the news because most political decisions are made for them, Saudis are transfixed by the demonstrations in Egypt. People debate it in evening salons; children ask their parents what it all means. This is unprecedented in the kingdom. According to analysts in the region, no matter what happens in Egypt, the region will never be the same, and leaders have to quickly come up with policies that address popular grievances. February 2, 2011  As the power of the Internet is used to promote change in Egypt, it also is used to promote violence around the world. When working to counter those violent online campaigns, specialists say, the messenger is as important as the message. January 31, 2011  Most Egyptians who work in Saudi Arabia are young and highly educated. They are there to work as teachers and in high tech because there are no jobs for them in Egypt. They watch the news and try to call home, but they keep their enthusiasm quiet given the Saudi government's concerns about political uprisings. January 26, 2011  Saudi's social media activists spread videos and news updates at the peak of the street protests in Tunisia — and the interest has stayed high ever since. Many wonder if the Saudi government will clamp down on this free-wheeling speech. January 25, 2011  Sometimes life is just ironic. That was certainly the case for Carie Lemack today. She's the founder of Global Survivors Network, an organization for families who have lost loved ones in terror attacks.